Prepare a tissue before reading this heartbreaking story: A 6-year-old pupil died after a snake attack inside his classroom last Wednesday. 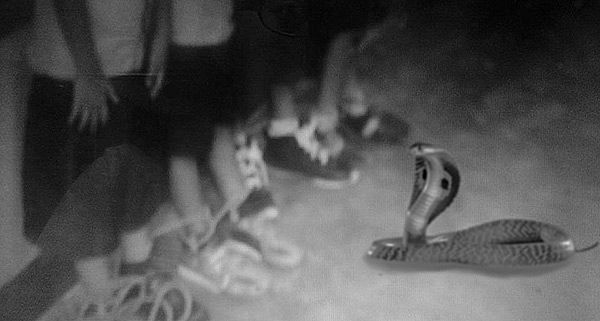 The snake-biting incident happened in the morning of October 19 inside an elemantary school in Sitio Trese, Barangay Tubaon in the town of Tarragona, Davao Oriental province. According to Facebook user Liweng Lopez, the boy got bitten in the face and was brought to the hospital alive but weak as he was vomitting a lot. The victim was identified by a relative as Aryl Allas Matais. His aunt, FB user Queen May posted that before passing away, his mother Michelle promised that she will bring him to a mall to buy a transformer toy if he would fight for his life. Aryl, however, refused and gave up. The boy's father screamed for help and cried in the hospital while the mother went home to get some clothes and documents needed for the admission, Lopez narrated in a post. The child died inside the ambulance while on the way to the Davao Regional Hospital in Tagum City, Davao del Norte, about thirty minutes after being referred to the bigger and more-equipped medical facility, Lopez posted. Somehow, it was fortunate that there were no other victims. The teacher, according to the source, grabbed her pupils and brought them to a safer area when the snake took position for another deadly attack.